The early settlers of our Santa Clara Valley have left their mark on�our�area's cultural history and, in many cases, their names as well. Whether it be inventions, commerce or agriculture,�these early�contributors to our valley have been remembered and honored�by the city with streets baring their surnames. Stevens Creek Boulevard was named for Captain Elisha Stephens the first man to lead a wagon train through the Sierra Nevada in 1844. McKee Road�was named for Henry Mckee, who along with his son, Joseph, ferried � Santa Clara Valley's first shipment of fruit from the port of Alviso to the bustling little town of San Francisco. Willow Glen's Coe Avenue, bares the name of the man who created the invaluable process of dehydrating fresh fruit. Henry Willard Coe's innovative�process brought a great economic boom to our valley's fruit industry. Some streets, such as Race Street, were�named for�an event rather than a person. This original 76 acre plot of land was the scene of highly competitive bicycle and horse races, ergo the name. It is said the race track was a favorite racing spot for Leyland Stanford's prize stead "Palo Alto". In addition to these famous names, there are those who� may not be so readily recognized, but whose contributions�were equally important. They�were the farmers and ranchers who successfully worked their little plots of land. They�produced the�labor, fruit and vegetables that contributed to our Valley's�early success. Of�these early immigrants, many were young Italians�who came to this country during the great European migration. Numerous streets bear�their names- among them: Albanese Cr., Azzorello CT, Bruno Dr., Brunetti Ct., Campisi Ct., Cheichi Ave., Di Napoli Drive,�Di Solvo Dr., Geovani Ct., Cribari Ln, Ferrari Ave., Rubino Way, Speciale Way and Teresi Ct.
As I drive along the outer perimeters of Willow Glen proper, I can see these names dotted on road signs along Almaden expressway and on the quiet�side streets of town. Long time valley residents, like myself,�recall with a certain reverence, those more simple days in our valley,�when Almaden's back roads were lined with fruit orchards, fields and livestock. It was a time�when most of our families and friends worked these thriving fruit and nut orchards, a time when a "chip" was something the cow left behind, a "window" was for looking through, a "menu" was something you� ordered from in a restaurant, and a "mouse", well, a mouse� was something the cat dragged home. But as their land becomes more scarce,�their�name�will always remain�behind in the form of�a street sign ,"Mazzone Drive",�a kind reminder of a by-gone day and a family's contribution. Today, the Curci�cherry�orchard has long�since given way to city�growth. However, in recent years, when the city cut through the land to create a new�roadway�the street was judiciously�named for Uncle Jim and his family, who, for so many years, worked that bountiful�ranch land.�And,�yes, I�must admit to feeling a sense of pride�each time I drive past the sign and the old ranch sight. 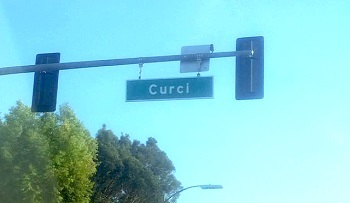 � "Curci Drive", like other street signs�that bear the names of�our early settlers, is a�reminder of the early immigrants who�so generously dedicated�their lives�to our valley's days of "Sunshine Fruit and Flowers".